2. Simultaneously wash rice and keep aside. 4. Take out the steam if its soft meat and then add some ghee to it along with sauf and dal and fry it nicely. Add some green chilly and ginger and 1.5 tsp of salt at this time and fry nicely till meat and dal is cooked nicely. It will take about 5 minutes. 5. Add 5 cups of water and once it starts boiling add rice to it. Water should come just above the rice. Let rice soak a bit of water for a minute or two. 6. Once rice soaks water, add a cup of milk and freshly cut pudina leaves to it and mix it with a light hand. Check salt at this time and add if you feel its less. 7. Close the lid and cook for 5-7 minutes/1-2 whistles. 8. Once steam is released. Mix it nicely and serve. Have this khichdi by sprinkling some desi ghee accompanied with onions and green chutney. 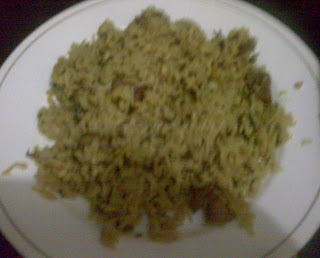 The meat used for this khichdi is generally chest(sine ka) meat or else mota kheema. 1.If one wants to make mutton curry the process is same as that of mutton mentioned above, just avoid putting cloves, jeera and kali mirj to it and then fry it later with 2 potatoes to it. Fry till alit leaves oil and then add water according to consistency and then cook for 5 minutes by covering with a plate. Also add 2 tsp of dhaniya powder instead of 1. 2. Cooking of kheema requires same process as mutton. Don't add more onions like in usual kheema.